ORLANDO, Fla., January 23, 2019 — The USTA today announced that it has hired former Top-60 pro Brian Baker as a National Coach for Men’s Tennis, based out of the USTA National Campus at Lake Nona in Orlando and reporting to Head of Men’s Tennis Kent Kinnear. Best known for his perseverance through a multitude of injuries, Baker ranked as high as No. 52 in the world and reached the fourth round at Wimbledon in 2012. He also won two ATP doubles titles and represented the U.S. at the 2016 Rio Olympics. Rajeev Ram, 32, of Carmel, Ind., will become a first-time Olympian by joining the 2016 U.S. Olympic Tennis Team in Rio in men’s doubles. Ram, who holds nine career ATP doubles titles, will team up with first-time Olympian Brian Baker, who is also competing in singles. Ram was added to the team as a result of a withdrawal by the reigning Olympic Men’s Doubles Gold Medalist team of Bob and Mike Bryan for ‘personal reasons’. Fan favorites Grigor Dimitrov and Eugenie Bouchard crashed out of the Citi Open on Tuesday at the hands of Dan Evans and Camila Giorgi respectively. Dimitrov played with malaise in the afternoon heat, creating an opportunity for Evans that he seized upon. The Brit dictated with his one handed backhand and came away with a 6-4 6-4 victory in less than an hour and a half of play. Dimitrov was broken in the opening game of the match, then broken once more after breaking back. He had a chance at the end of the first set to get the match to 5-5, but failed to do so. In the second set, it was more of the same, with Evans steady on his serve, snuffing out chances for Dimitrov. Evans attacked Dimitrov’s serve and ended up 5-2 up, and serving for the match. He had three match points serving 5-2, but Dimitrov clawed back, and made a late rally, holding at love to force Evans to serve for the match once again at 5-4. Despite the final game going to deuce, a fifth match point was finally the clincher for Evans, as Dimitrov’s baseline game simply broke down when it mattered. A woeful season continues for Dimitrov, while Evans is perhaps making his move into a regular ATP tour quality player. Bouchard, another would be star who has had woeful results this season, fell to Giorgi 7-5 6-4. She was behind the entire first set, at one point 4-1 down, only to break back, before eventually being broken on her own serve when serving to force a first set tiebreak. In the second set, the story repeated itself, with Giorgi going 4-2 up, Bouchard breaking back, but losing her own serve at 4-5 with the match on the line. Giorgi only had one match point, but it’s all she needed to score a big win. In other WTA results, Naomi Broady defeated Irina Falconi 6-3 6-4, Sabine Lisicki was all smiles against Kristina Kucova 6-3 7-5, Christina McHale got past the unorthodox Monica Niculescu 6-3 6-4, Tamira Paszek defeated qualifier Lauren Albanese 6-3 6-4, Monica Puig won the lone battle on the day against Oceane Dodin 6-2 4-6 6-3 in two hours, and Risa Ozaki stunned Sloane Stephens 6-2 6-1 in less than an hour. Stephens played one of her worst matches of the season, while Puig looked dominant until she didn’t against Dodin, and had to fight her way back. In the lone ATP doubles match on the day, Lukasz Kubot and Alexander Peya won a tight battle against Brian Baker and Austin Krajicek 4-6 6-2 10-8. As for ATP singles, there were a lot of close tiebreak matches on the day. Brian Baker needed two tiebreaks to defeat the big serving Sam Groth. Groth was poor on return, as is usual, but just a few points difference separated the two men, as a frustrated Groth easily could have been the winner instead. Fellow American Ryan Harrison didn’t play incredibly great, but he still defeated a likely jet-lagged Stephane Robert 7-6 6-3. Ivan Dodig retired down 6-2 4-2 against Yoshihito Nishioka, as he was also feeling the effects of fatigue. Austin Krajicek lost twice on the day, as he also fell in singles at the hands of Rendy Lu, 6-1 7-6. Donald Young found himself in a tight contest with lower ranked qualifier Ernesto Escobedo, he eventually prevailed 6-4 3-6 6-3, as Escobedo had few chances in the third set to get back into the match. Tall American Reilly Opelka battled hard for what would have been a big win against Malek Jaziri, but Jaziri was steady on his own serve, despite his struggles against the American’s height. The match finished 6-7 7-6 7-6, as late in the third set, Opelka was experiencing shoulder pain and had to call the trainer. With as well as he played against an ATP tour regular, Opelka showed more than a glimpse of his potential. Another young gun, Denis Shapovalov, put up quite the contest against an ATP regular. Lukas Lacko needed three sets against the young Canadian, winning 7-6 4-6 6-4. The first set of the match featured four breaks of serve, while the second had just one, which went against Lacko. Shapovalov tightened up his game as the match went on, while Lacko forced him to hit a lot of his one handed backhands, a lethal, but at times erratic shot for him. In the third, Shapovalov was serving to make it 5-5, but found himself broken on match point, sending Lacko into the next round by the skin of his teeth. Despite the loss, it’s clear Shapovalov has the game to compete well on the ATP tour as a young gun. Alexandr Dolgopolov found himself in a two hour war against Jordan Thompson. Dolgo was cruising up 6-4 in the first set, and connecting on his blistering shots from both wings. He played a miserable second set however, losing it 6-1, and in the third set, he was a comfortable 5-2 up, before getting broken and eventually forced into a third set tiebreak, a tiebreak that he got ahead in, and didn’t look back, taking the match 6-4 1-6 7-6. Though he surely wished the match had been easier, Dolgopolov packed the stands with his exciting play. In late action, Benoit Paire dominated Jared Donaldson 6-0 7-5, and Sam Querrey came back from a shock first set dropped against Bjorn Fratangelo to win 6-7 6-4 6-4. Querrey wasn’t broken in the match until late in the third set, and at that point he was still 5-3 up, and served the match out in his next service game to earn an important victory. Thunderstorms moved in late on Tuesday, interrupting Steve Johnson vs. Adrian Mannarino (4-2 for Johnson), Kristina Mladenovic vs. Samantha Crawford (6-2 1-3), and Lauren Davis vs. Shelby Rogers (4-4). Those matches will be completed today. The tournament marches on today with big matches on both the ATP and WTA side as the top seeds take to the court. NEWPORT (July 13, 2016) If I don’t like Mondays at a tournament, then I love Wednesdays. Today’s Tennis Hall of Fame Championships featured six second round matches and a single first round match under cloudless skies and very breezy conditions. Victor Estrella Burgos became the last man in the second round with a routine 7-6(3), 6-3 win over American Dennis Novikov. Meanwhile, on Stadium Court, Frank Dancevic played his fourth match in four days and came out swinging against the big-serving Ivo Karlovic. Ivo had just two aces in the first set, but settled down to win a tiebreak in the second, netting ten aces in that frame. He added another eight in the final stanza, and Dancevic gave up his only break in the match at 4-4 to set up Karlovic to serve it out. He did, and advances as the favorite to beat Marco Chiudinelli in the quarterfinals. 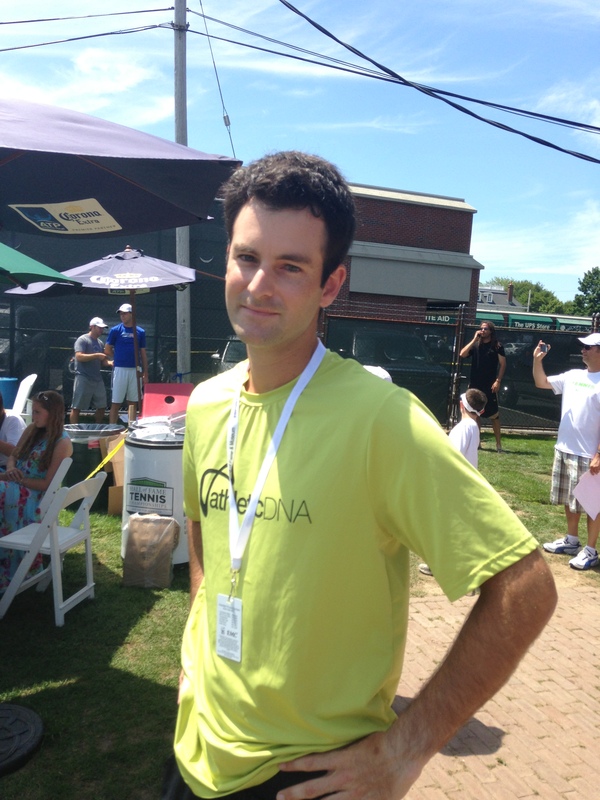 Asked about his slow start, Karlovic told Tennis Atlantic, “It was windy and it was early. I didn’t really wake up soon. 11:00, I normally have breakfast, and today I already had a match, so I didn’t really wake up”. On winning a title in Newport after two appearances as a finalist, he said, “Yeah, I’m ready. If not, then when? So, I’m ready. This year I got a bye, so hopefully this year four matches will be enough”. Johnson’s victory was also unexpectedly lopsided, as he posted a 20-minute breadstick on Sugita and cruised into the quarters, 6-1, 6-4. Brian Baker had a wonderful ride in Newport, winning his first match since 2013 in Cinncinati. Marcos Baghdatis stood in his way of the quarterfinals, and both played very well from the start of the match. Baghdatis simply played better, winning 91% of his first service points to 81% for Baker in the first set. Baghdatis advanced, 6-4, 6-3, and will meet either Dudi Sela or defending champ Rajeev Ram tomorrow. I normally don’t like Mondays at a tennis tournament. You get leftover qualifying rounds and a few first round matches. The real red meat of the tournament always starts later in the week. So Monday is tennis subsistence day. Like watching Lucas Lacko, who reached the third round of Wimbledon, flame out in the first round at Newport. The best part of that match was learning that the victor, Dudi Sela, was traveling with his 2 year old and 7 month old, and he looked really busy after the match, like “we need you now” busy. Sela faces off against defending champ Rajeev Ram in the second round. Ram cruised over Mackenzie McDonald later in the day to set up the second round match. 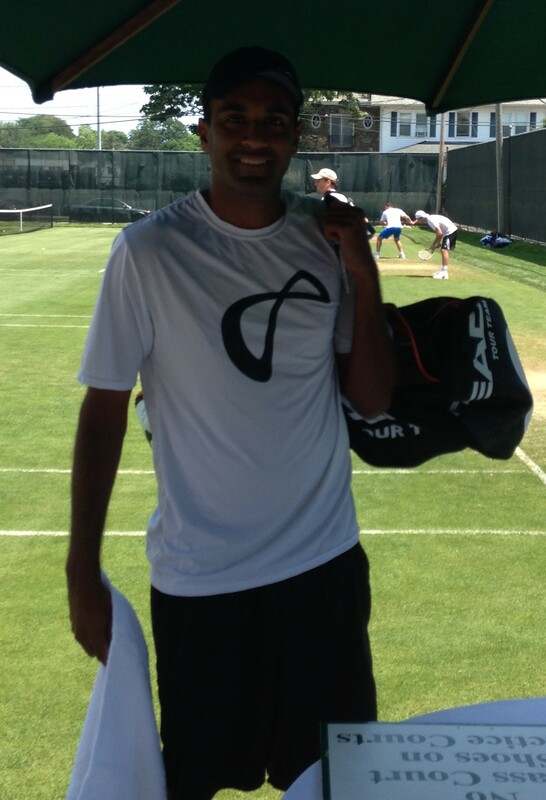 As for McDonald, the UCLA champ was in great spirits just to have had the opportunity to play on Center Court in Newport. That made Monday better. The first sign that it wasn’t going to be the usual Monday were the qualifiers: Old hands Frank Dancevic and Alex Kuznetsov advancing in three grueling, up-and-down sets. Then it was Brian Baker’s turn. Baker, after spending only 25 minutes on court yesterday due to the retirement of Jan Hernych, had a closer match against Great Britain’s Brydan Klein. Baker looked like his old self again, and he closed out the match to qualify in straights/ Seeing him out there was enough to make my Monday. As he heads to the Olympics next month to represent the U.S., Baker told Tennis Atlantic, “I feel great. I’m getting fitter and better each week. I just need to get some more matches. This year has been a little bit of a struggle just because coming back from so much time off, and playing the bigger events with my protected (ranking), if you’re not winning a ton, you’re just not getting a lot of matches. It’s nice this week to already get two matches under my belt and hope to get more”. One good thing about Mondays is a chance to see young players on the rise and local players of interest. Today, the crowds got to see Rhode Island’s own Jared Donaldson. In fact, they wouldn’t have been much of a press corps here today without Donaldson on the schedule. Donaldson is an intense young player with a bright future. I will let the entire local press corps tell you all about him, because going against the grain is what Mondays are all about. I will tell you that he lost in straights to Donald Young, but that is all. FLUSHING, N.Y., August 13, 2013 – The USTA announced today that Brian Baker, playing in his first Grand Slam since the 2013 Australian Open, 2012 Olympian and former world No. 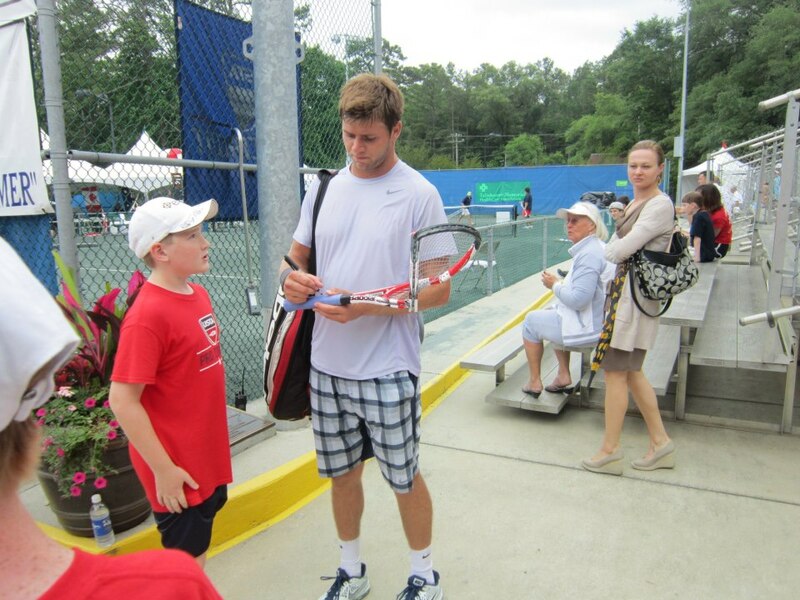 43 Ryan Harrison, 2010 NCAA singles champion Bradley Klahn and 2011 NCAA singles finalist Rhyne Williams have been awarded men’s singles main draw wild card entries into the 2013 US Open. Other American men receiving US Open main draw wild cards are Rajeev Ram and 2013 USTA Boys’ 18s champion Collin Altamirano. Australia’s James Duckworth and France’s Guillaume Rufin will also receive wild cards. The 2013 US Open will be played August 26-September 9 at the USTA Billie Jean King National Tennis Center in Flushing, N.Y. Both the men’s and women’s singles champions this year will earn $2.6 million, the largest payout in tennis history, with the ability to earn an additional $1 million in bonus prize money – for a total $3.6 million potential payout – based on their performances in the Emirates Airline US Open Series. Baker, 28, of Nashville, Tenn., is attempting to make yet another remarkable comeback from injury. 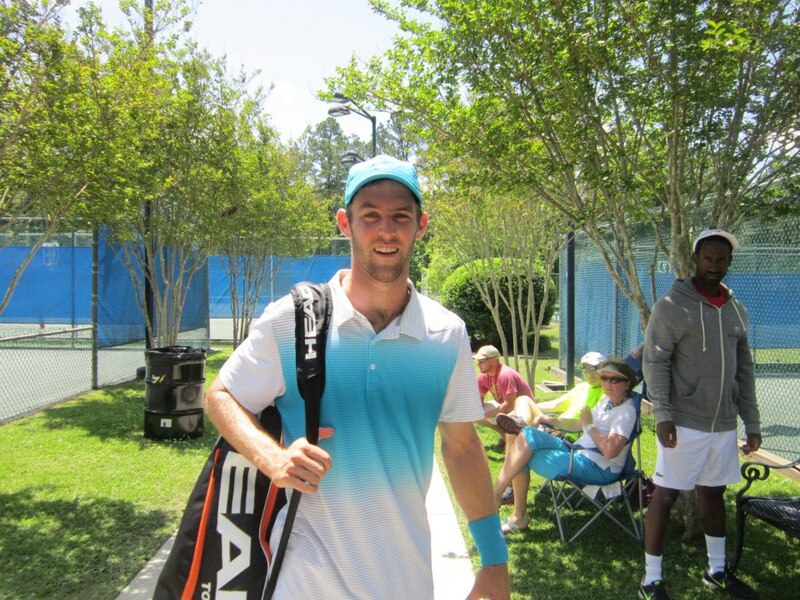 After being sidelined since the 2013 Australian Open in January, when he suffered a significant knee injury during his second-round match against Sam Querrey, Baker returned to competitive play last week at the USTA Pro Circuit $100,000 Challenger in Aptos, Calif., and has advanced to the second round of this week’s Western & Southern Open in Cincinnati on the Emirates Airline US Open Series. Baker, now ranked No. 185, ascended to No. 52 in the world in 2012 after injuries kept him sidelined for nearly six years. Harrison, 21, of Shreveport, La., rose to No. 43 in the world in 2012, the year in which he also represented the U.S. in the London Olympics and in Davis Cup. On the Emirates Airline US Open Series this summer, Harrison, now ranked No. 102, reached the semifinals at the BB&T Atlanta Open and defeated former world No. 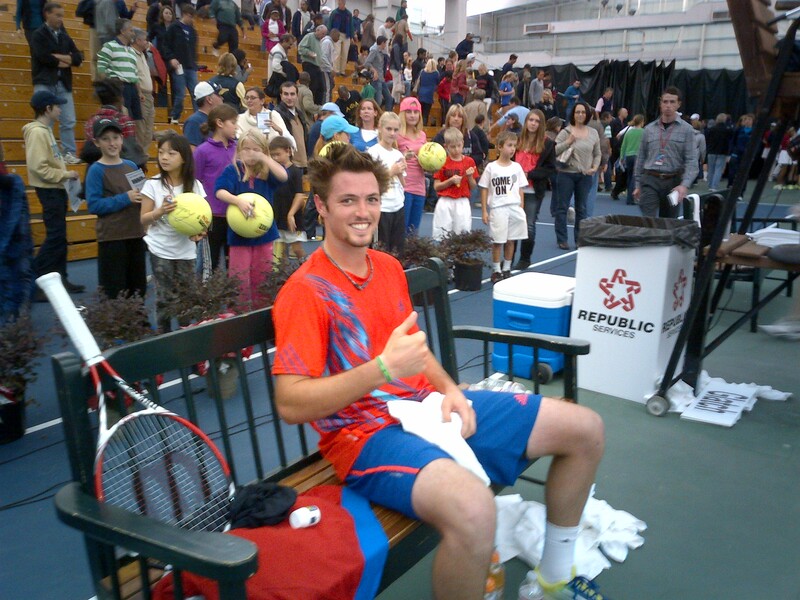 1 Lleyton Hewitt in the first round of the Citi Open in Washington, D.C.
Klahn, 22, of Poway, Calif., earned a US Open wild card as the top American points earner at select USTA Pro Circuit events this summer. The 2010 NCAA singles champion while a sophomore at Stanford, Klahn won the USTA Pro Circuit $100,000 Challenger in Aptos, Calif., last week, catapulting to a career high rank of No. 123. Last year, Klahn received a wild card into the US Open Qualifying Tournament, qualified and reached the second round, becoming the first men’s qualifying wild card to win a US Open main draw match. Williams, 22, of Knoxville, Tenn., reached his first ATP semifinal in Houston this year and played in the main draws of the French Open and the Australian Open, winning a USTA playoff to gain entry into the latter. Now at a career-high rank of No. 114, He was a 2011 NCAA singles finalist while at Tennessee, and his grandfather, Michael DePalmer, Sr., was the Volunteers’ longtime coach who helped found the Nick Bollettieri Tennis Academy. Ram, 29, of Carmel, Ind., is the highest ranked American who did not receive direct entry into the US Open at the entry deadline. Ram owns one singles title (Newport, 2009) and seven doubles titles on the ATP World Tour and has been ranked as high as No. 78 in singles. Ram qualified and reached the second round of the 2013 Australian Open. Altamirano, 17, of Yuba City, Calif., earned his wild card by winning the USTA Boys’ 18s National Championship singles title, doing so in historic fashion. Altamirano became the first unseeded player to win the tournament in the 71 years it has called Kalamazoo, Mich., home. Duckworth, 21, of Sydney, Australia, received a wild card through a reciprocal agreement with Tennis Australia, which will grant an American a wild card into the 2014 Australian Open, to be determined by a USTA playoff (Rhyne Williams was the 2013 winner). Currently at a career-high rank of No. 150, Duckworth reached the second round of the 2013 Australian Open and qualified for both the French Open and Wimbledon this year. Rufin, 23, of Charnay, France, received his wild card through a reciprocal agreement with the French Tennis Federation, which awarded a wild card into the 2013 French Open to an American player designated by the USTA (Alex Kuznetsov won the USTA Pro-Circuit event-based system this year). Rufin, currently ranked No. 92, has played in all three Grand Slam main draws this year, reaching the second round of the Australian Open and Wimbledon. In addition to the eight US Open men’s singles main draw wild cards, the USTA also announced eight men who have been awarded wild card entries into the US Open Qualifying Tournament, which will be held August 20-23 at the USTA Billie Jean King National Tennis Center. One additional US Open qualifying wild card will be awarded to the winner of the 2013 US Open National Playoffs – Men’s Championship, taking place August 16-19 in New Haven, Conn.
Players receiving 2013 US Open qualifying wild cards are: 2013 USTA Boys’ 18s National Championship runner-up Jared Donaldson (16, Cumberland, R.I.); 2011 French Open boys’ champion Bjorn Fratangelo (20, Pittsburgh, Pa.), who has won three Futures titles in 2013; Christian Harrison (19, Shreveport, La. ), who reached the 2012 US Open doubles quarterfinals with his older brother, Ryan Harrison; Jarmere Jenkins (22, College Park, Ga.), who came one win short of winning the NCAA triple crown this summer, leading Virginia to its first NCAA team title, winning the NCAA doubles title and reaching the NCAA singles final; former Wimbledon and French Open boys’ semifinalist Mitchell Krueger (19, Fort Worth, Texas), who won his first pro singles title in June; UCLA sophomore Dennis Novikov (19, San Jose, Calif.), the 2012 USTA Boys’ 18s national champion who defeated 2013 Wimbledon semifinalist Jerzy Janowicz in the first round of last year’s US Open; local teenager Noah Rubin (17, Rockville Centre, N.Y.), who has been as high as No. 6 in the world junior rankings; and Tennys Sandgren (22, Gallatin, Tenn.), a former standout at Tennessee who has won five USTA Pro Circuit Futures singles titles in the last two years. The 2013 US Open will be held Monday, August 26, through Monday, September 9. Tickets for the 2013 US Open can be purchased four ways: 1) at USOpen.org; 2) by calling Ticketmaster at 1-866-OPEN-TIX; 3) at all Ticketmaster outlets; or 4) at the USTA Billie Jean King National Tennis Center box office.